Well, really bacon progress. The bacon is now cured, rinsed and drying in pillowcases in the garage. On Monday, Dan will fire up the smoker, with its new Bradley smoke generator and maple briquettes, and smoke it. He promises me that he will put something super-duper in the articles, showing the process. The back bacon looks particularly good and the butcher who butchered the pigs has agreed to slice the bacon, so roll on the first bacon buttie. Even if it is bad for you! Finally, the Ryeland Flock Book Society has sent me a form to upgrade my membership to "flock-owning". So Juno, Jura and Jinx are now the foundation stock of the Rosedean flock of pedigree Ryelands. I don't think they are awfully impressed, though. It's funny how their personalities are showing through now they've settled in. Jinx was really shy and skittish when we got them but she's now the boldest and the most vocal. She also has a very distinctive voice - actually, I think I can recognise all three now. There are certain books that I return to again and again - sort of comfort reading. Falling into that category are the books by James Herriot. When I was young, I really wanted to be a vet, and devoured these books. And I keep going back to them - no surprises in them but they still make me laugh and cry. Dan's tried but can't get them - that's why he knows less about being a "vit'nary" than me! Jinx has lost her ear tag - well, technically it's not lost - it's on top of the key cupboard in the scullery. But it's not in her ear, where it should be. And she now resembles some kind of punk sheep with her ear cut in two. It's a hell of a wound to have been made by a plastic tag. I think her show days are over before they even started! We were checking them over today and immediately noticed that her ear was bleeding and the tag was gone. She must have caught it in the hay net - so no more hay nets. I've sprayed the wound with iodine and it stopped bleeding - fortunately, it's past the time for flies. Other than that, I'll leave well alone. Dan fired up his smoke generator today and smoked one piece of streaky bacon. The rest will get done tomorrow. He's really pleased with his new equipment - now he's talking about building a smoke house! The best thing is that he's got the generator in the greenhouse - to get it in, he had to clear out the greenhouse, a job I've been trying to get to all week. So I can score it off my list without having expended any effort! We trimmed our sheeps' feet for the first time yesterday. It wasn't as traumatic as I expected - for anyone! Ian, husband of Jane, who bred our shhep, came down to lend us the clippers and offer advice. He also brought the "purple spray" in case we got carried away. However, Jane and I had discussed this on the phone and agreed that we'd rather be cautious and trim more often than risk cutting too far. I'm trying realy hard to stick to my regime of cleaning the horse pasture. Four barrowloads on Saturday, same on Sunday and two today. I almost cried with relief when Chris said he'd be taking his three in at night soon. All bar two of the ten barrowloads went on to our garden - I know we'll have weeds but I hope that the hens will clear out at least some of the weed seeds. They certainly love the muck and do a brilliant job of breaking it down. An article in the local rag this week gave me an idea, though. The article was about Tillicoultry Allotment Society getting planning permission to build a car park and fence in the allotments. It's been a real success story. The area used to be really run down but a new committee has transformed it - all 42 plots are taken and there is a waiting list of 19. Anyway, the article gave the Secretary's phone number so I gave him a call and he's coming down on Thursday with some others to get some horse dung for the allotments. The deal is they shovel it into the trailer and we deliver it. Sounds good to me! In advance of me getting my finger out and putting up some proper information on making bacon, here's a quick video showing our smoker setup. Before we got the Bradley smoke generator we used a gas-ring to heat a metal plate, on which we would pile sawdust. It produced pretty good smoke, but also too much heat. Now the generator sits in the greenhouse, the smoke goes through the cardboard box and up the tumble-drier hose, outside and into the smoker. By that time it's pretty much at the ambient temperature, which at this time of year means damned cold. Yesterday lunchtime I ordered a pair of hoof shears for the sheep from Farmrite. The website was easy to use, and it had a little box to fill in to say what to do if we weren't in to take the delivery (leave it in the greenhouse). This morning at 9am they dropped through the letterbox in a jiffy bag. The price was extremely keen, the delivery charge reasonable, and they put a little sticker on the front with the instructions I'd put on the form. Dan and I have just returned from a visit to Holland. The purpose of the trip was to visit the grave of my Uncle David, who was killed in May 1944 and is buried in the village of Brielle, near Rotterdam. It was an emotional journey, but I'm glad we made it. David was my mother's only sibling. He was 21 when he died, a Flight Engineer on Lancaster bombers. His plane was shot down on the way back from a raid and, although the crew managed to bail out successfully, David was shot by snipers on the way down. He was with the Dutch Resistance for a few days before he died, which is why he is buried in a village cemetery. Neither my grandmother or my mother ever made it to Holland, but I promised my mother I would go - and now I have. Tess goes for her operation tomorrow - thank goodness, as she's getting a little stir crazy! We buy our cat food from the vet, so although we didn't have much left, I didn't buy any at the weekend, knowing that we'd get some tomorrow. Anyway, we really are down to the last few morsels so I opened a can of tuna for the cats. Cass is getting stuck in; Felix is licking it like I'm trying to poison him. So he's having the very last few bits of dried cat food, while Cass has a wee mouthful of cream. 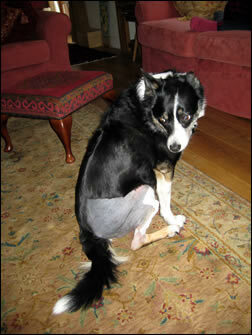 Tess finally had her surgery on Thursday to repair the damage caused by the rupture of her cruciate ligament. She seems to be none the worse for it apart from a bad haircut! We've taken the wee bandage off her front leg but we're not brave enough to remove the dressing from the site of the operation - hey, that's what we pay vets for!